Hollywood used to specialize in blockbusters. Nowadays, the industry’s trying to specialize in franchises. It’s not enough to deliver a singular, entertaining, standalone film. Movies like The Amazing Spider-Man 2 and X-Men: Days of Future Past now have to exist to set up the next film (or series of films). And it’s not just comic-book movies that are guilty of this practice. Almost every major motion picture makes bold steps to build larger worlds, from YA adaptations like The Hunger Games and Divergent to our current box-office leader, Godzilla. Gareth Edwards’ rebirth of Godzilla didn’t hammer fans over the heads with obvious foreshadowing. Instead, he laid clever, small Easter Eggs all over his Godzilla feature film… even though most of them were "blink-and-you-missed-them" quick. Now that the movie has been playing for almost two weeks, fans have been able to revisit Godzilla and scour its backgrounds for clues about possible directions the already announced Godzilla 2 could go. What have they seen? 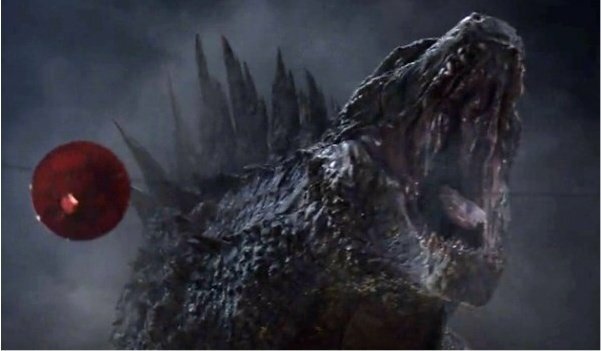 Because, to its credit, Godzilla wants to work as a standalone film, Gareth Edwards didn’t overpower his visuals with Easter Eggs that will reference future happenings in sequels that he didn’t yet know were going to happen or not. But he did make callbacks to the numerous Godzilla movies that came before him. Fans have had a lot of fun pointing out battle moves from this film’s third act that were lifted from classic Godzilla movies of the past. I’ve even seen sites analyze the chunks that are taken out of building in Gareth Edwards’ Godzilla, claiming that they mirror bits of destruction in past movies. - The "Bikini Islands" are mentioned, a nod to the nuclear testing of Operation Crossroads, which we will discuss in depth in our third point. - The "monsters" typically emerge from the Pacific Ocean, with some specimen dating as far back as 4 million years. - When Bryan Cranston’s name is listed in the credits, there’s a reference to a "Walter Malcolm" arguing about government men in white lab coats keeping dirty secrets. This is what Cranston’s character does in the movie, but his name on screen is Joe Ford. I’ve searched for this reference, but only keep coming back to Cranston’s two most famous roles on Breaking Bad (where he played Walter White) and Malcolm in the Middle. Is that Walter Malcolm? Am I missing something, Godzilla experts? - The redacted facts go WAY back, saying that there are "many references to living dinosaurs in the Bible," and that "there are countless other passages that refer to ‘dragons’ as well." - Finally, there’s a line in the redacted credits that makes me laugh. When costume designer Sharen Davis is listed, the redacted credits claim, "Are these animals real? Can we prove they even exist or are they merely men in rubber suits with … tricksters." That’s a great nod to the old methods of bringing Godzilla to life on screen. Clearly, we’ve come a long way since then. Mothra has been the most-discussed Godzilla Easter Egg among fans. The creature is hinted at in the scene where Joe Brody (Bryan Cranston) and his son, Ford (Aaron Taylor-Johnson), return to the scientist’s quarantined home. In the foreground, you can spot a broken aquarium with what supposedly housed a metamorphosis because there is a label "Moth." That piece of tape is covering up another label that adds the letters "ra." That’s a hat-tip to Godzilla’s nemesis Mothra, a kaiju who appeared on screen in 1961 and recurred in several Toho Godzilla films. 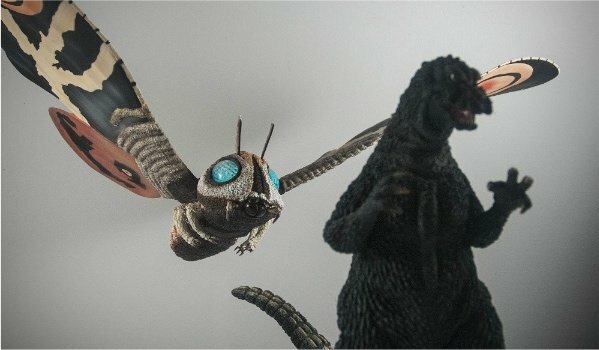 To some fans, Mothra is "The Joker" to Godzilla’s "Batman." Toho, I believe, would have to grant Legendary Pictures the rights to include famous creatures like Mothra, Ghidorah, Rodan or Anguirus. But with Godzilla tearing up the box office, those conversations should be brief, and fruitful. Gareth Edwards proves at so many points during Godzilla that he has a firm grasp on the history of the character – and global history, in general. Naming Ken Watanabe’s character Dr. Ishiro Serizawa, for example, is a direct link back to the 1954 Godzilla film, where Daisuke Serizawa (Akihiko Hirata) makes the ultimate sacrifice to protect our planet from Godpzilla’s wrath. Other references rely on a scholarly knowledge of our past. 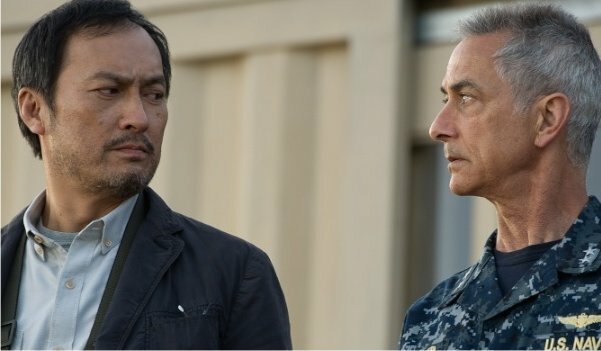 Take the name of the boat captained by Admiral William Stenz (David Strathairn) as our Navy pursues Godzilla during his own personal mission. Stenz pilots the U.S.S. Saratoga, a ship with direct ties to nuclear testing triggered by our nation in 1946, almost one year after the bombings in Hiroshima and Nagasaki. The Saratoga participated in tests the U.S. staged at Bikini Atoll (dubbed Operation Crossroads) to determine the effects a nuclear bomb would have on battleships. These atomic experiments historically have been connected to the birth – or awakening – of Godzilla in Gareth Edwards’ film and ALL of the films that happened before it. Putting Strathairn on the deck of the U.S.S. Saratoga is a subtle nod to Godzilla’s place in our planet’s dangerous nuclear past, but you have to be up on your history to get the joke. Also, Godzilla screenwriter Max Borenstein reveals in this video that the working title for Godzilla was Nautilus -- a reference to the USS Nautilus, the first nuclear submarine launched in 1954 (the year the first Godzilla movie opened). HISTORY! What other Easter Eggs did Gareth Edwards pepper throughout his Godzilla reboot? Please share the ones you thought you saw in the comments section below!